My style of writing is short, and to the point with few question marks. By BLOGS are more “cowboy” than HARVARD, but most folks get my points. For the cowboy blog today, I am going to speak (write) loud and clear about the dangers of taking a body off an older Airstream Trailer and replacing the rust, rats, and compromised aluminum with healthy newly manufactured replacement steel. The challenge is and always has been for the novice is, an understanding of the complexities of how the round peg goes into the round hole! 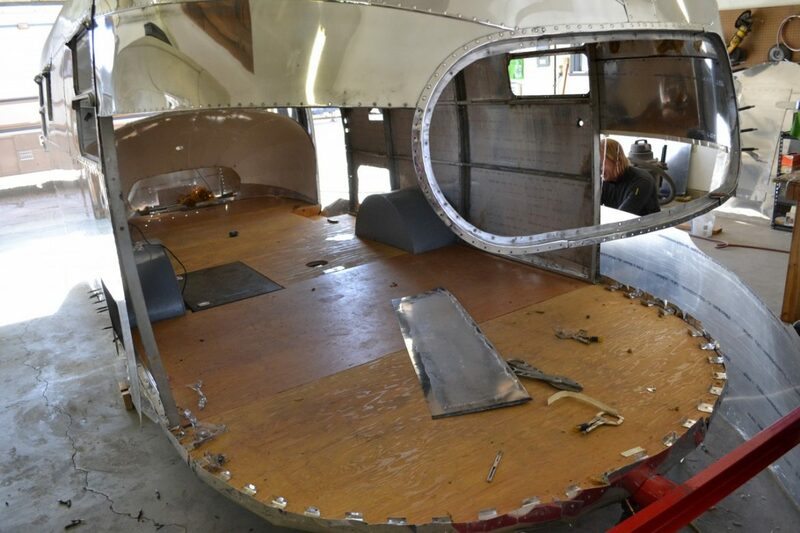 Without this knowledge or experience (which most folks have ‘NONE”) the Airstream restoration project will never be road worthy and safe for you, your family or business. Specifically, when all the exterior rivets and bolts holding the body to the frame and the wood, the “u” channel is then, and only then be ready to be raised up to access the entire metal frame making a professional inspection. Most times, the repair “cadet” (owner or even the so-called repair shop) cannot merge the body back to the channel securely and bolt the assembly and lock washers together. It is imperative to have safety belts holding the suspended body above the frame while any welding, re-enforcing, and custom wood floor replacement is completed. Back-up safety is always a must and one can never go out on a limb to save time. It’s just not worth the risk! Screws then are set into the wood sub-floor (every 6 inches) while the bolt and lock washers are set in the channel approximately every 2 feet. As we hear all the time; it’s always better to have a little more attention to detail than not. If you have questions, give me a call but, before the call, go back and test every bolt and chassis screw for proper spacing and torque.